"A unique blend of farming simulation and bullet hell!" 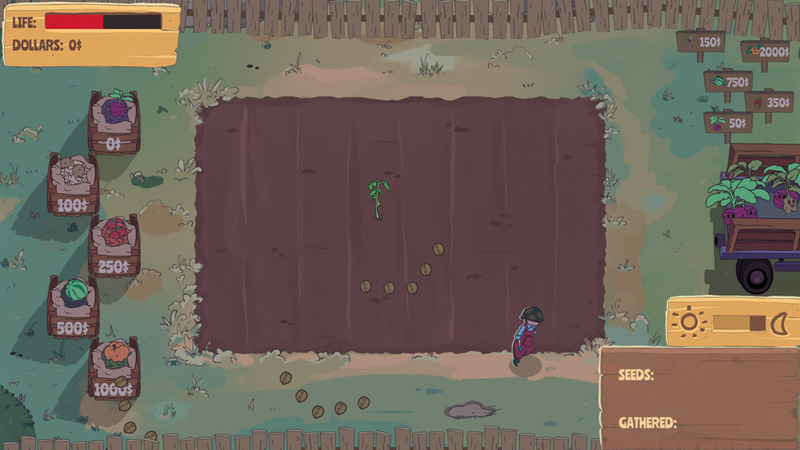 Cropshots is a unique blend of farm simulator and a bullet hell game where you must plant vegetables in to the ground which can then be sold for money however after each vegetable that you plant grows it will start shooting seeds at you and you will need to master running and avoiding the seeds until the torrent of them has finished firing at you. You can start off only planting the free seeds, but once you load them in to the truck then you will get paid a small amount of dollars which you can then use to buy a more expensive which in turn will give you a more expensive vegetable to sell and meaning you can keep working up to the most expensive seeds but which also offer the most return when loaded on to the back of the truck. 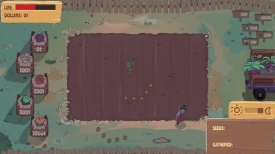 So that is most of the farming part covered but where the game gets more interesting is after you plant each seed and depending on which seed it is they become more rapid and vicious in firing seeds at you. The only objective other than staying alive seems to be making as much money as you can before you inevitable get taken down by one of your very own vegetables that you brought to life! It’s a fun game but most likely not for long periods of time. You can download Cropshots here for free.